This casserole is to die for, the ultimate dinner for cheese lovers or anybody who loves Frank’s Red Hot buffalo wing sauce. The bread cubes give it an awesome crunch and the cheesy buffalo goodness makes this one of the best comfort casseroles. My advice to you is to indulge yourself with this one, even if you try to eat healthy. Preheat the oven to 375F and grease a 3 quart casserole dish. In a large saucepan, melt 6 tbsp of the butter then whisk in the flour. Continue to whisk the mixture until golden brown (about 3 minutes). Slowly add the milk to the mixture, continuing to whisk to break up clumps. Continue to whisk the mixture until it thickens (about 10 minutes). Add the seasonings, 4 cups of the cheddar cheese and 2 cups of the jack cheese to the mixture, continuing to stir until all of the cheese is melted. In a medium bowl, combine the chicken, buffalo sauce and onions and toss until well mixed. 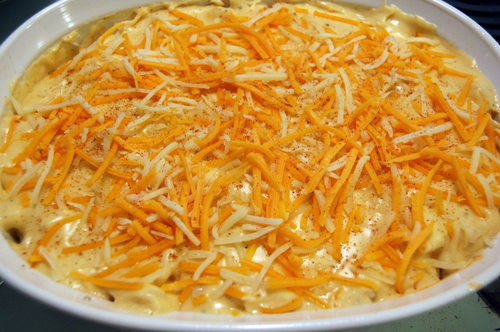 To build the casserole, place a layer of noodles over the bottom of the dish, then layer with the cheese sauce, shredded cheddar cheese and buffalo chicken, repeating until all of the food is layered. 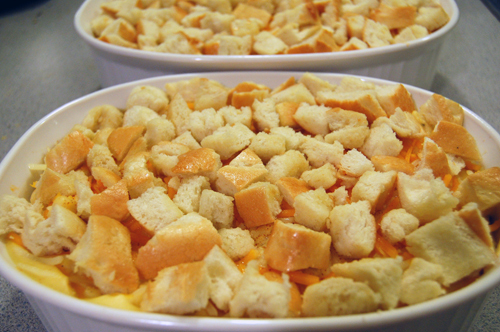 Melt 2 tbsp butter and toss with the bread cubes, then spread across the top of the casserole. Bake at 375F until top is golden brown and cheese is bubbling (about 30 minutes). You’ve totally just combined 2 of my favorite things! I can’t wait to try this out! This looks delicious! I have a buffalo chicken & blue cheese mac n cheese that I love, but I’ve never put bread on top. Yours looks absolutely yummy! And – why not indulge a little before vacation? I think you deserve it! Wow, this looks great and sounds delicious! Easy too. My kids love these flavors I’ll have to tell them about this recipe!!! Yum! Love the combination. Great idea. I just made this like 2wks ago on my blog,isnt it amazing?! Definitely try adding the bread topping, even though I burnt mine a bit, it made it so tasty with that extra crunch! That is awesome, and yes it is! The best flavors. This looks fantastic–I can’t wait to try it! Mac and cheese + buffalo chicken……I am all over this. Two of my favorite things. What a great recipe..love how you made it! This is a must try and I think my kids will love it!!! So much cheese! I’m in love. You are so, so bad and I love it!! This is such a common flavor combo in such an uncommon format! Since I don’t like pasta, I could always use more bread cubes and make it into more of a strata type thing. A-mazing! This sounds delicious. We like to eat healthy, but I don’t believe in depriving myself, and both pasta and cheese are on my must eat list. I think you could make this recipe far lower in fat and still have all of the flavor. Whenever I make a white sauce (béchamel) I always use olive oil instead of butter, and just enough to moisten all of the flour, so in this recipe you may only need 3 T, or less. I think you could use half the amount of cheese without losing any flavor since you are using sharp cheese with a strong flavor, and you could use a 2% cheese if you wanted to lower the fat even more. I probably wouldn’t use more than a tsp of salt, but that would be to taste. Also, try a handful of Panko breadcrumbs as a crunchy topping, no butter needed, yum. All the comfort, but a little healthier! PS I make a lot of your recipes, and love them, especially the spinach, feta quiche (which I make with egg beaters)! Thanks, keep up the good work! What a wonderful recipe. I love the buffalo chicken flavor. I just found this recipe and it looks fantastic…I can’t wait to try it! Just two questions though, how long did you put it in the oven for at the end and did you cover it? Pardon my ignorance – but how do you print these recipes? I love anything Buffalo Chicken, so I’m sure I would LOVE this! I will definetly be trying this! Oh my goodness, this looks too good – would be a HUGE hit in our home. Let’s see, we are expecting 50 degrees and rain for the next FIVE days so I think this recipe might be deserved. The greatest food since sliced bread! hahaha and that might not be an exaggeration! What an Amazing recipe!!! I will be making this one for sure! This recipe looks awesome! I love anything “buffalo style”! Can’t wait to make it! It came out awful when I made it but Im horrible at cooking! Being a vegetarian I skipped the chicken, used quinoa pasta, added in some frozen mashed butternut squash and it came out realy yummy. I used less cheese and milk too to cut down a little on the calories. This recipe is so good, my family loves it!